London: Parliament House (designs for). Design for a rectangular panel in relief, showing figures wrestling in a landscape setting. You are here: CollectionsOnline / London: Parliament House (designs for). 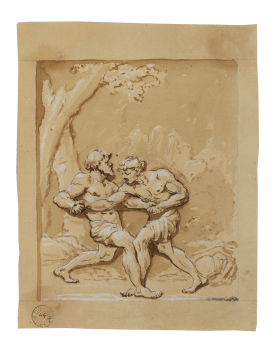 Design for a rectangular panel in relief, showing figures wrestling in a landscape setting. One of a set of designs, Adam vol.7/41-44, for four rectangular panels in relief, showing the martial arts, fencing, staves, boxing, wrestling, part of a larger group of pen and wash drawings with heightening, Adam vol.7/21-44, that are all designs for the relief decoration of James Adam's Parliament House scheme of 1762/63. The predominant theme is British history and the figures are dressed in either early seventeenth-century or classical costume. The principal draughtsman was Antonio Zucchi (1726-95), although some of the figure compositions are probably the work of Agostino Scara, of whom James Adam wrote that he '... draws figures full as well as Brunias...' (J. Fleming, Robert Adam and His Circle in Edinburgh & Rome, London, 1962, p.279). Adam gave great emphasis in his Parliament scheme to the role of decorative sculpture and this probably explains the survival of so much material of this sort. In his unfinished essay on architectural theory of 1762, Adam explained: 'What is meant by outside decoration is sculpture, statues and bas-reliefs, together with foliage, trophies, frets, interlacings and a thousand such ornaments which, if properly applied, give such amazing magnificence and render an ediface so wonderfully interesting...' (Fleming, op.cit., p.317). The four designs for relief panels in Adam vol.7/41-44 were probably intended for the hall interior of the Parliament scheme, shown in the perspective view in Adam 7/23.